A source close to the BobcatsHockeyBlog.com has confirmed that Quinnipiac University Men's Ice Hockey commit Dom Fensore has made the United States National Developmental Program for the 2017-2018 season. Fensore, a defenseman out of Thornwood, New York spent the past four days at the evaluation camp at the USA Hockey Arena in Plymouth, MI going against the top 2001 born prospects in the United States trying to win a coveted spot on the roster which ended up happening. He was impressive during the camp which led hockey scout and SB Nation writer Jeff Cox to write this about him after the camp. "Pay no attention to his height. His footwork and skating are so good he can overcome that. He retrieves pucks, breaks the puck out of the zone and acts as a fourth forward. His gaps and layers are good. He has a good shot and is a prototypical modern era puck transporter. He scored a goal each day. Monday he joined the rush and scored on a wrist shot from left circle. On Tuesday he took the puck from the corner of the attacking zone and cut out to the slot and sniped. Is he as good defensively as some others at camp? No, but it’s not enough of a detriment to keep him off the team. Latching on to him early was a big time coup for the Bobcats staff." This past season Fensore was a standout playing for the P.A.L Islanders 16U team averaging more than a point per game from the blue line. In 23 games played he had 27 points (10 goals and 17 assists) with 10 of the points coming by way of the power play. He had two more points in two playoff games for the Islanders. Prior to joining the P.A.L Islanders program, Fensore played with the Mid Fairfield hockey program. The 5'7 145 pound defenseman committed to Qunnipiac in April of 2016 just days after the Bobcats lost in the National Championship game to North Dakota. He is a high end prospect that is expected to be drafted in the 2019 NHL Entry draft. 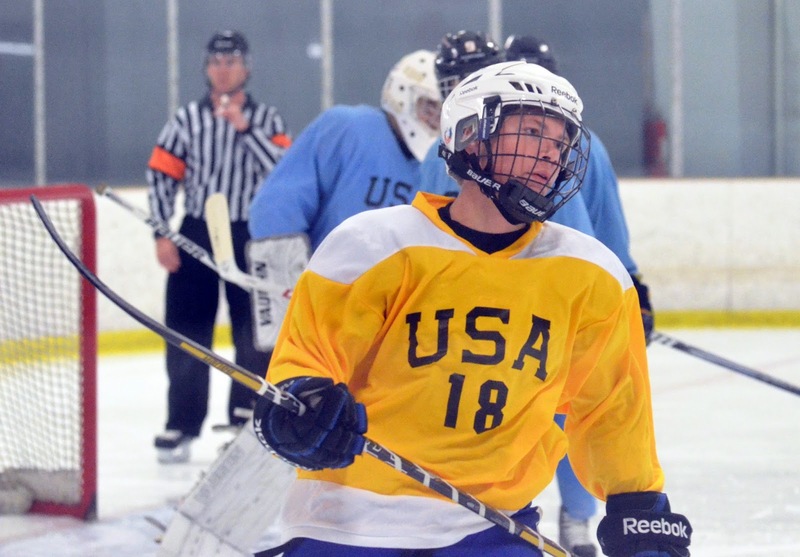 Projected to reach Hamden in the 2019-2020 season, Fensore will become the second player to come directly from the US National Program following senior captain Connor Clifton. The Frozen Four is set with Denver, Harvard, Minnesota-Duluth and Notre Dame the four teams that will head to Chicago to battle it out for the National Championship. Pulling for Harvard is the way to go as they have represented the ECAC well this year winning both the conference regular season and tournament titles, the Ivy League title and the Beanpot prior to winning the East Regional this past weekend. Good luck to the Crimson and bring home another national championship for the ECAC. Let's take a look at some of the future Bobcats still playing for their junior teams. It was a very good week for 1997 forward Odeen Tufto. He had six points (2 goals and 4 assists) in the past week and is now on a four game point streak with all of them being in the multi-point variety. Since his trade to the Sioux City Musketeers (USHL), Tufto has been over a point per game player with 18 points (7 goals and 11 assists) in 17 games played. He has moved into the top 10 in the USHL in scoring with 46 points (15 goals and 31 assists) in 55 games played. His 31 assists tie him for 6th in the league in that category. The Chaska, Minnesota native should give the Bobcats some increased scoring next season when he arrives in Hamden. The top rated goaltender in North America had a season best 42 saves in a 4-3 win for the Muskegon Lumberjacks (USHL). Keith Petruzzelli, a Wilbraham, Massachusetts native picked up his rookie leading 20th win of the season on Friday. He has been strong down the stretch for the Lumberjacks as they look to clinch a spot in the Clark Cup playoffs. On the season, Petruzzelli is 20-10 with a 2.45 goals against average, a .915 save percentage and boosts two shutouts as well. He will enroll in the fall with his brother D.J. 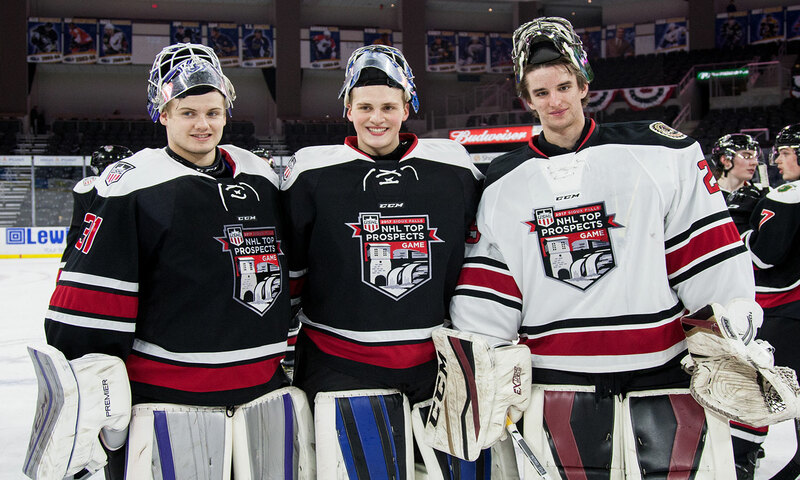 and compete with Andrew Shortridge and Chris Truehl to form a deep goaltending trio for the Bobcats. 1999 forward Matt Cassidy had two goals this past weekend for the Springfield Jr. Blues (NAHL). Cassidy, a Medford, New Jersey native is riding a four game point streak (3 goals and 2 assists). On the season he has 35 points (14 goals and 21 assists) in 51 games. He got off to a slow start with 5 points in his first 18 games but has since adjusted well and has shown growth in his game which has turned into production. As of now I have him projected to arrive in Hamden in the fall of 2018. Merritt Centennials (BCHL) 1998 defensemen Zach Metsa probably had his biggest assist of the season with his overtime helper to propel Merritt to a 2-1 win to force a 7th and deciding game tonight against Penticton. Metsa has assists in back to back games and in 10 playoffs game has 5 assists for the Centennials. Hamden native and 1996 defensemen Joe O'Connor's Brooks Bandits (AJHL) team is playing in the Viterra South Division finals against the Okotoks Oilers beginning Friday March 31st. Brooks is the heavy favorite to win the entire AJHL title and make a deep run for the RBC Cup. In four playoff games, O'Connor has a goal and 3 assists. He will be joining a talented Bobcat defensive core in the fall of 2017. 2002 forward Jake Quillan's season is over as his Steele Subaru Major Midget team was swept in the NSMMHL finals in three games. In 11 playoffs games, Quillan scored 8 points (1 goal and 7 assists). As the youngest player on the roster he finished the regular season with 28 points (8 goals and 20 assists) in 36 games. Its likely he will be with Steele Subaru again next season. Five Quinnipiac commits are heading to USA Tier I nationals. North Jersey Avalanche teammates Corey Clifton and Justin Robbins are playing in the 18U division while Selects Academy teammates Ethan Phillips and PJ Fletcher are playing in the 15U division while Mid-Fairfield bantam forward Victor Czerneckainair is playing in the 14U division. Good luck to all of them. Senior forward Tommy Schutt has signed an amateur tryout agreement with the Manchester Monarchs of the ECHL as was announced by the organization in a press release. Schutt, an associate captain this past season for the Bobcats had the best season of his four year career with 14 points (6 goals 8 assists) in 40 games played. In four years with Quinnipiac, Schutt played in 158 games and scoring 41 points (18 goals and 23 assists). Schutt does a lot of the little things that Rand Pecknold stresses in his players like winning face-offs and blocking shots and that is something that he excelled at during his time at Quinnipiac. He was 6th on the team with 36 blocked shots which was 3rd among Quinnipiac forwards. A native of Chanhassen, Minnnesota, Schutt came to Quinnipiac by way of the Lincoln Stars (USHL) where he played two seasons. He played in the NCAA tournament in three of his four seasons with Quinnipiac and was part of two ECAC regular season championships (2015, 2016), one ECAC tournament championship (2016) and was part of the Quinnipiac team that was the 2016 National Runner-Up. He was also part of a senior class that won 102 games, which stood third behind North Dakota's 109 wins and Denver's 105 wins. Congrats to Tommy on this great accomplishment and the BobcatsHockeyBlog wishes you nothing but success in your career. The Quinnipiac Bobcats men's ice hockey season came to an end this past Friday with a loss in the ECAC semifinals to Harvard University. While it is disappointing that the program did not reach the NCAA tournament for a fifth consecutive season, the team gave everything they had against the Harvard Crimson, a team that has been one of the best teams in the country this season and is a number one seed in the NCAA tournament for a reason with a good chance at winning the National Championship. The coaching staff led by Rand Pecknold and his associate coaches Bill Riga and Joe Dumais did a great job leading this team to 23 wins with the amount of injuries they had at times and the lack of overall depth on the roster. They have a good nucleus of players returning along with a very solid incoming recruiting class that has the potential for some immediate impact. While the college season is over for Quinnipiac, it doesn't mean the hockey season is over as many junior programs are still going on so we will continue to do the recruiting notes until season concludes. Let's take a look at how some of the future Bobcats did over the past week. Delta Hockey Academy Elite 15 2001 defenseman Nick Kent had a great week. Not only was he selected to take part in the USA Hockey NTDP Evaluation Camp, he had the best three game stretch of his season in the playoffs for Delta. In three round robin playoff games, Kent was tied for the team lead in playoff scoring with six points (2 goals and 4 assists). While Delta did not advance past the round robin stage of the playoffs, Kent's play should give him some good momentum heading into the evaluation camp this week with a shot at winning a spot on the Under-17 team for next season. Best of luck to Nick this week. Also joining Nick at the evaluation camp is fellow 2001 defenseman Dom Fensore. I talked a lot more about both of them last week in this piece. I also wish Dom the best of luck this week as he also looks to win a spot on the Under-17 team for next season. 1997 forward Odeen Tufto had a three point game Saturday for the Sioux City Musketeers (USHL) in an 8-1 win over Team USA. Tufto had a two goals and an assist in the win. It's the third three point game of the season for him along with his tenth multi-point game. The Chaska, Minnesota native has 40 points (13 goals and 27 assists) in 52 games played for the USHL Western Conference leaders. Tufto's 27 assists tie him for 8th in the USHL in that category. Hockey scout Kirk Luedeke took in the Sioux City game and had this to say to me about Tufto after his three point performance. "Quick little slashing skater. Goal lucky- sharp angle & billiard shot but little buzz saw type. Will be good NCAA player". Muskegon Lumberjacks (USHL) 1999 goaltender Keith Petruzzelli picked up his 19th win of the season as he continues to lead all rookie USHL goaltenders in that category. Petruzzelli made 18 saves in a 9-1 Lumberjacks win over the Tri-City Storm on Friday. Petruzzelli, the top ranked North American goaltender in the NHL Central Scouting Rankings is 19-10 with a 2.43 goals against average and a .910 save percentage with two shutouts this season for Muskegon which is second in the USHL Eastern Conference in the standings. 1999 forward Matt Cassidy of the Springfield Jr. Blues (NAHL) had a three point weekend with a goal and two assists. His goal and assist game on Friday was his ninth multi-point game of the season. In 49 games played, Cassidy has 33 points (12 goals and 21 assists). Sources with the BobcatsHockeyBlog confirm Michael Lombardi, a 1998 forward who played this season with New England Prep Champion Kimball Union Academy has signed to play the 2017-18 season with the Chilliwack Chiefs of the BCHL. This is a good landing spot for Lombardi, who has the talent to flourish in the BCHL and continue his development. He scored 51 points (19 goals and 32 assists) in 39 games played for Kimball Union this season. With Lombardi finding a home expect other prep and high school players to find a home soon for next season. 1999 forward Matt Fawcett's rights are held by the Sioux City Musketeers so he could land there next season as he already played a couple games with them already this year as an affiliate player. Two North Jersey Avalanche players also will have new teams next season. 1999 goaltender Justin Robbins possibly could land with the Chicago Steel as he was on the teams protected list this season and saw action in one game for the Steel this year. 1999 forward Corey Clifton's next location is unknown at this time, though could be a good fit with a team in the BCHL. 1996 forward Dan Nybondas committed last week and I highlighted him in this piece. Nybondas commitment likely concludes the 2017 incoming class. Playing for the HIFK U-20 team in the Jr. A SM-liiga, Nybondas has 32 points (14 goals and 18 assists) in 48 games played. His playoff statistics are not none at this time. He is playing on an olympic sheet of ice in Finland as well so he will have to make the transition to the smaller size rinks that are used in the United States. Quinnipiac found him via word of mouth with a coaching staff member traveling to Finland to see him. The hope is that this will lead to Quinnipiac building relationships with the Jr. A teams in Finland where the Bobcats can secure talented Finnish players before they come over to the United States to play junior hockey. Maybe this will help the Bobcats find their own version of Eeli Tolvanen a top Finnish prospect committed to Boston College and playing in the USHL who is expected to be a first round pick in this June's NHL entry draft. Four commits are currently playing in the playoffs with their respective junior or midget clubs. 1998 defenseman Zach Metsa of the Merritt Centennials is in the second round of the BCHL playoffs. He has one assist in six playoffs games. 1996 defenseman and Hamden native Joe O'Connor is playing the Brooks Bandits in the second round of the AJHL playoffs. Brooks is the odds on favorite to win the AJHL championship as they are loaded with 10 NCAA commits. O'Connor has two assists in two playoff games as Brooks had a bye in the first round. 1997 forward Devin Moore is playing for the Brockville Braves in the first round of the CCHL playoffs. In three playoff games, he has one assist as his team trails two games to one. 2002 forward Jacob Quillan is playing in the NSMMHL best-of-5 finals starting tomorrow against the Cape Breton West Islanders. Quillan has 7 points (1 goal and 6 assists) in 8 games played, highlighted by his overtime winner in Game 2 of the semifinals against Halifax McDonalds. Here is the video of his overtime winner. 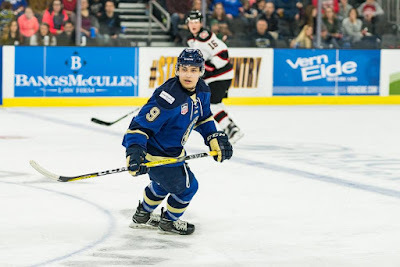 One other note of importance is 1998 forward Khristain Acosta who is currently playing for the Sioux Falls Stampede is no longer committed to the program. Chip Malafronte of the New Haven Register is reporting that the Quinnipiac Men's Ice Hockey 2017-2018 non conference schedule has been announced. Once again for next season, there is a lot of Hockey East flavor. The opponents for next season are the same as they were this season with some location changes. The Bobcats will welcome the Maine Black Bears for two home games along with single home games against Boston University, UMass Amherst and Vermont. Quinnipiac is slated to play Boston University in the next two seasons with a return trip to Agganis Arena in the 2018-2019 season. Quinnipiac played both UMass and Vermont this past season the latter in the Friendship Four Championship in Belfast, Northern Ireland. With Vermont coming to Hamden in 2017-2018, it would surprise me if the Bobcats returned to favor the following year and played on the road against Vermont in Burlington. On the road the Bobcats will head out to the desert for the first time and face Arizona State for two games, a team that split with Quinnipiac in Hamden this past season. Quinnipiac will also head to historic Matthews Arena in Boston to face Northeastern for two games along with single road games to Boston College, UMass Amherst and UConn. With Quinnipiac also playing a road league game against Harvard, they will play four games in the Boston market next season giving alumni in the area a good chance to see the team multiple times. Boston College, Boston University, Northeastern and Vermont have the best chance for Quinnipiac at helping in the pairwise next season based on how the teams fared this season. UMass Amherst should also see improvement with the talented recruiting class they are bringing in next season along with surefire top ten draft pick Cale Makar headlining the UMass recruiting class. 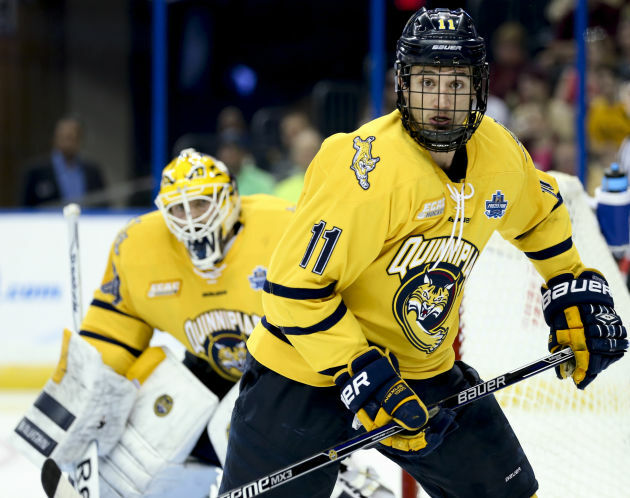 Quinnipiac senior forward Tim Clifton has a signed a two-year, two-way free agent contract with the National Hockey League San Jose Sharks. The signing was first reported by Frank Servalli of TSN. The Matawan, New Jersey native was an alternate captain this season for the Bobcats and finished 4th for Quinnipiac in scoring with 25 points (13 goals and 12 assists) in 39 games played. Clifton, had a breakout junior season in which he scored 43 points (19 goals and 24 assists) in 39 games and was a coveted free agent last season but returned for his senior season with brother Connor to finish up his degree. In 155 games played for Quinnipiac, Clifton had 95 points (44 goals and 51 assists) and help build a culture of winning in Hamden in his four years with the program. It is not not known at this time if Clifton will report directly to the Sharks or their top American Hockey League affiliate, the San Jose Barracuda. Congrats to Tim and his family on this great accomplishment. In the home of the most famous upset in sports history, the Quinnipiac Bobcats fell behind in the third period 3-1 with 16 minutes left to play seeking some of the 1980 US Men's Olympic Hockey Team magic. 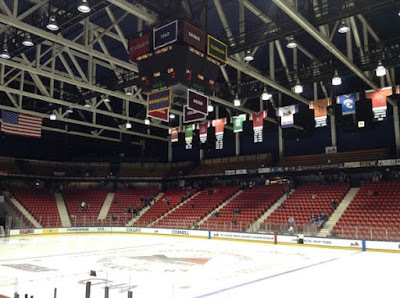 There would be no magic tonight in the house of the "Miracle on Ice" as the Bobcats ECAC Tournament run to Lake Placid and its 2016-2017 season has come to a conclusion. Needing to win out this weekend to reach its fifth consecutive NCAA tournament, Quinnipiac couldn't keep Harvard's top ranked offense at bay. The two teams came out skating well and feeling it each out for the better part of the first period. Andrew Shortridge made two big saves early, but gave up big rebounds on both that the Bobcats were able to clear. Midway through the period, Harvard had a flurry of chances and spent a good minute to a minute and half in the Bobcat zone peppering multiple shots on Shortridge before Quinnipiac was able to clear the zone. Quinnipiac finished the period strong putting a few real good chances on Merrick Madsen who stood tall. Harvard out shot Quinnipiac 13-6 in the opening frame with Andrew Shortridge playing a key role in why the game remained scoreless. Harvard continued to pepper Shortridge in goal in the second period but it wasn't until Michael Floodstrand stole the puck in a battle against Bo Pieper on the board after which he brought down into the zone where he fed Sean Malone in the low slot who buried a wrist shot past Shortridge. Quinnipiac answered a little more than five minutes later after Harvard's Jake Horton took a hooking call giving Quinnipiac its second power play of the game. Thomas Aldworth took a pass down low from Derek Smith where he snuck one past Madsen for the goal. Luke Shiplo also picked up an assist on the goal. Harvard would respond two minutes later when Sean Malone put home a rebound off of Nathan Krusko's shot. It was the third game in the last four where the Bobcats gave up a goal in the final minutes of a period. In the third period it was the hottest player in the ECAC tournament finding the back of the net again as Sean Malone made a nifty back hand shot past Shortridge for the hat trick to extend the Harvard lead to 3-1. It was the 4th goal of the tournament for Malone and 9th point in total in the last three tournament games. Quinnipiac had a few power play chances in the middle of the period but couldn't muster a goal past Madsen. Luke Esposito put the game on ice with an empty net goal to end the season earlier than Bobcat fans have been accustomed to seeing. Andrew Shortridge made 32 saves in the loss and kept Quinnipiac in the game closer than it could have been with some strong saves at key times. 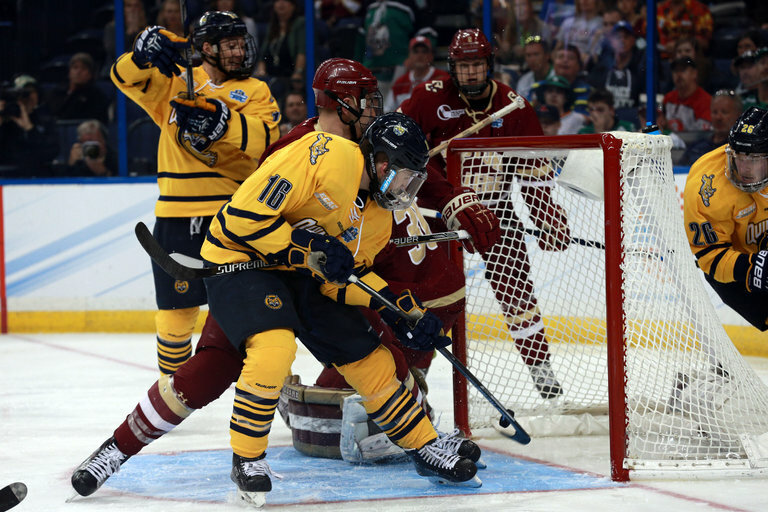 Quinnipiac just couldn't get the breaks it needed or cook up enough offense against a Harvard team that might be the school's best since the 1989 national championship team. While Quinnipiac's season is over, Harvard will head to ECAC championship where they will face rival Cornell for the Whitelaw Cup. The Quinnipiac 2017 senior class of Connor and Tim Clifton, Derek Smith, K.J. Tiefenwerth, Tommy Schutt and Joe Fiala completed their careers with 102 wins, 2 Cleary Cup Championships, a Whitelaw Cup Championship, 3 NCAA tournament berths and was the 2016 National Runner-up. These six players will be missed and we thank them for their contributions to the Quinnipiac hockey program and to the university community as well. For the fifth consecutive season, the No. 19 Quinnipiac Bobcats men's ice hockey team will play in the ECAC Final Four. It was one season ago that the Bobcats broke through and won the program's first ever Whitelaw Cup as the champions of the ECAC tournament. In the semifinals, Quinnipiac faces the No. 2/2 Harvard Crimson a team that the Bobcats split with this season and faced in Lake Placid the past two seasons. This is the rubber match of the regular season and the last two postseasons with a trip to the ECAC finals on the line. Quinnipiac won the first meeting 4-2 but the game was heavily dominated by Harvard who controlled the play for the majority of the game. Harvard took the second game 5-2, but it was a 1-1 score in the second period when the wheels came apart when Harvard scored three consecutive goals in a minute time frame which led to the ejection of head coach Rand Pecknold by ECAC referee Chip McDonald. Junior goaltender Chris Truehl started both Harvard games but was pulled in the second period of the loss to Harvard and replaced by Andrew Shortridge who proceeded to make all 12 saves the rest of the way. All-time, Quinnipiac is 13-12-4 against Harvard. 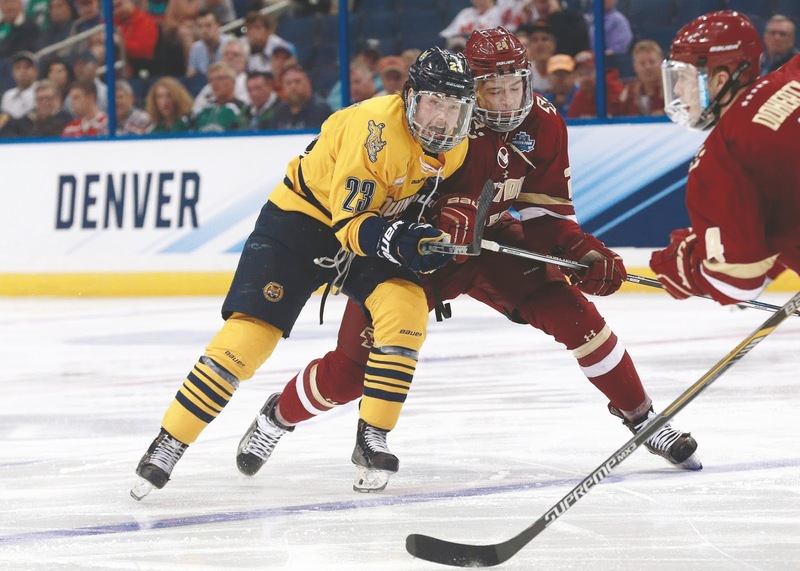 While Harvard is a lock to reach the NCAA tournament and a possible favorite to reach the Frozen Four in Chicago, Quinnipiac will have to win the ECAC tournament if it wants to make the NCAA tournament for the fifth consecutive season. Quinnipiac comes into this game having swept Brown in the ECAC first round and most recently won a hard fought road quarterfinal series in three games against St. Lawrence. They are 10-4 in their last 14 games and have some momentum coming into Lake Placid fresh off a road playoff series win for the first time in ten years. Quinnipiac has gotten outstanding goaltending from Andrew Shortridge who in his last 20 appearances has a 1.79 goals against average and a .931 save percentage. He has been money for Quinnipiac down the stretch as they have started to turn it on. The Bobcats have also started to score down the stretch at a tune of 3.875 goals per game in their last eight games. The Bobcat defense in that same stretch of games is giving up 1.75 goals per game. While scoring goals is the nature of the game, I am not sure you want to get into a shootout with Harvard as that plays right into what they want to do. Quinnipiac needs to slow the pace of this game down and play it on their terms with being physical, blocking shots, stay out of the penalty box, and doing the little things that Rand Pecknold always stresses. Harvard might be the hottest team in the country outside of Denver, having gone 13-0-1 in their last 14 games and winning 12 straight games. They have won the Beanpot Championship, the Ivy League Championship and sharted the Cleary Cup Championship with Union. This is by far the most talented team top to bottom in the ECAC and they have played like it for pretty much the entire season. Boosted with the top scoring offense in the country and an excellent power play, Harvard can be unstoppable at times. No lead is safe against the Crimson. Just ask Yale who coughed up leads in both games against Harvard in last weekends quarterfinal series. They have a slew of talented forwards that know how to create offense and put the puck in the net. The key to Harvard this year has been their ability to play much better defense along with an improved transition game and that is due in part to freshman Adam Fox and John Marino having outstanding seasons for the Crimson. While they are average on the penalty kill they do lead the country with 12 short-handed goals so that is something to watch out for. Goaltender Merrick Madsen has been strong this season with a 24-5-2 record with a 2.26 goals against average and a .915 save percentage. He did look a bit shaky in net against Yale last weekend and in Harvard's first game against Quinnipiac this season in Hamden. If he is not on top of his game, it gives Quinnipiac an opportunity for an opening to win this game. I struggled with this prediction as my heart is obviously in the direction of Quinnipiac but my head says Harvard. Quinnipiac had to scratch and claw their way to a series win against a St. Lawrence team that struggles to score at times while Harvard struggled a bit against Yale and yet still scored ten goals in two games. For Quinnipiac to win they are going to need contributions from everyone, key breaks, and for Shortridge to be a rock in between the pipes. Harvard has been the most consistent team in the ECAC and possibly the country this season and is primed to win Harvard's first national championship since 1989. I think Quinnipiac is going to play this game with nothing to lose, give everything they have, and will hold Harvard to two goals in regulation but comes up short in heartbreaking fashion as Harvard has too many skill players to account for. The Quinnipiac Bobcats have dipped into the Finnish junior hockey league for a recruit for the 2017-2018 season. A source has confirmed to the BobcatsHockeyBlog that HIFK Helenski U20 forward Dan Nybondas has verbally committed to Quinnipiac. Nybondas is a 6'6, 194 pound 1996 born forward playing in the Jr. A SM-liiga in Finland. This season in 48 games played for HIFK, Nybondas has 32 points (14 goals and 18 assists). That is good for third on the team in scoring. Nybondas will be the second European player on the Quinnipiac roster with defenseman Kārlis Čukste out of Latvia. This commitment might also open the door for future Finnish players to play for the Quinnipiac program. Not much is known about Nybondas at this time, but the website Finnish Junior Hockey who covers the U20 league gave this scouting report to me about him. "He has a good shot and scoring touch, can drive the net and has decent hands and skating ability. At times have seen some nice flashes of skill. Based on my viewings this season he might be more of a 3rd line center." With Nybondas coming in as a 21 year old freshman in the fall, Quinnipiac might have upwards of 12 incoming new players with seven of them being forwards, two freshman defenseman and a goaltender along with the two transfers that will become eligible in Brandon Fortunato and John Furgele. For the third consecutive week, a Quinnipiac freshman has been named the ECAC Rookie of the Week. 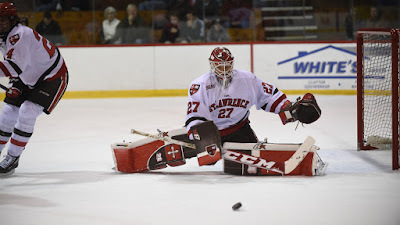 The last two weeks was goaltender Andrew Shortridge winning the award and now freshman Alex Whelan has been selected as winning the award this week. The Ramsey, New Jersey native had a strong weekend against St. Lawrence in Quinnipiac's best-of-three series win. In three games Whelan had two goals and an assist along with blocking shots and playing strong two way hockey. 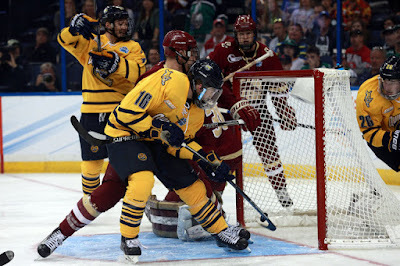 In Saturday's game, with Quinnipiac facing possible elimination, it was Whelan's goal 16 seconds into the game that gave the Bobcats momentum to turn the series around in their favor. He also assisted on Craig Martin's eventual game winning goal in the second period. In the winner take all Game 3, it was Whelan who stole a puck in the neutral zone and raced in the to St. Lawrence zone ripping a high shot past Kyle Hayton which would eventually go down as the game winning goal for Quinnipiac. Whelan has points in four of his last six games including two multi-point games in playoff wins over Brown on March 3rd and St. Lawrence on March 11th. On the season Whelan has 10 points (6 goals and 4 assists) and has been a staple on the top line with Craig Martin and Tim Clifton as his line-mates. Quinnipiac now heads to Lake Placid for the ECAC Semifinals where they will take on Harvard University in the semifinals on Friday. This is the third consecutive season that Quinnipiac has faced Harvard in Lake Placid losing in the semifinals in 2015 and winning in the championship game in 2016. Two Quinnipiac verbal commitments were selected today to the USA Hockey NTDP Evaluation Camp Roster that will take place March 24-28, at the USA Hockey Arena in Plymouth, Michigan. The players selected were defenseman Domenick Fensore a Thornwood, N.Y. native playing for the P.A.L. 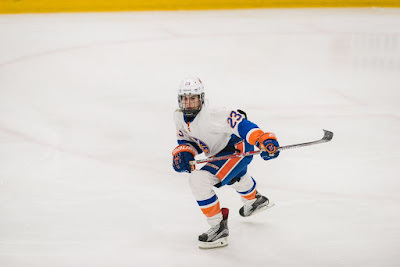 Islanders U16 team and defenseman Nicholas Kent, a Ladera Ranch, California native playing for the Delta Academy Elite U15 team based in Delta, British Columbia, Canada. The camp is designed to help select the 2017-18 U.S. National Under-17 Team. Fensore is a 5'7, 145 pound defenseman who has elite puck moving skills with tremendous ability to push the pace in transition according to SBN's Jeff Cox. This past season Fensore had 27 points (10 goals and 17 assists) in 23 games played for the P.A.L Islanders U16 team. Ten of his points came by way of the power play. In the USPHL U16 tournament of champions he had two assists in two games as the Islanders went 1-1. Fensore is eligible for the USHL draft eligible this season should be not be selected for Team USA and is eligible for the OHL priority draft this spring. Kent is a 5'8, 157 pound defenseman currently playing for the Delta Hockey Acedemy Elite 15 team in Delta, British Columbia, Canada under head coach Yogi Svejkovsky. 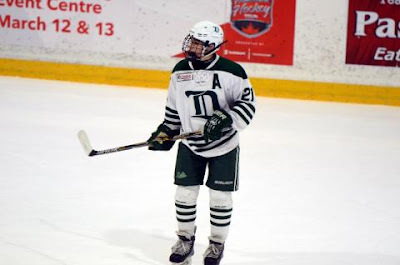 This is Kent's second year with the Delta program as he played for Delta's Bantam Prep team a year ago where he had 22 points (7 goals and 15 assists) in 25 games played. This season for the Elite 15 team he has 24 points (3 goals and 21 assists) in 30 games played. Two of his three goals came by way of the power play. Kent and his Delta teammates are now playing in the Canadian Sport School Hockey League playoffs starting Thursday. Prior to heading to Canada to play for Delta, Kent was a part of the Los Angeles Junior Kings program. He was drafted by the Saskatoon Blades in the 7th round of the 2016 WHL Bantam Draft and is also USHL draft eligible this season should be not be selected for Team USA. 2001 forward Connor Tait was also likely a candidate but didn't make the final cut for the evaluation roster. Jeff Cox had him last week on his final predictions of who would make the camp list. Quinnipiac trails Boston College and Boston University who both have six on the list while Harvard has four and Minnesota has three. Quinnipiac is tied with Ohio State and Wisconsin with two each on the list. Congratulations to both Domenick and Nicholas on this great achievement and the BobcatsHockeyBlog.com wishes you the best of luck at the NTDP Evaluation Camp. It was another great weekend for the Quinnipiac Bobcats men's ice hockey team as facing elimination they responded with back to back 3-2 road wins in games 2 and 3 at St. Lawrence to win a road quarterfinal playoff series for the first time since the 2007 season. Quinnipiac now heads to the ECAC final four for the 5th consecutive season and needing two wins to reach the NCAA tournament for the 5th consecutive season. Next up for the Bobcats are the top seed Harvard Crimson on Friday afternoon, a team that Quinnipiac split against this season. We will get more into that match-up later in the week but lets take a look at how some of the future Bobcats did over the past week. Muskegon Lumberjacks (USHL) 1999 goaltender Keith Petruzzelli had another week of good in between the pipes. In two starts he went 1-1 with a 1.48 goals against average. He made 58 of 61 saves in the two games he played in. On the season he is 18-10 with a 2.48 goals against average and a .913 save percentage. The incoming freshman is the top rated North American goaltender in the NHL Central Scouting rankings and is set to give the Bobcats the deepest goal-tending the program has seen in a long time with incumbent starter Andrew Shortridge and senior Chris Truehl currently in the fold. With Muskegon thick in the playoff hunt, its expected Petruzzelli will see his season play on into deep April or longer. 1998 forward Khristian Acosta is riding a three game point streak for the Sioux Falls Stampede (USHL). He has had assists in each of his last three games and now has four assists in 11 games played since moving to the Stampede from the Wilkes-Barre Scranton Knights (NAHL). Acosta is slated to arrive at Quinnipiac for the 2018-2019 season after spending another year in junior hockey presumably with Sioux Falls. Matt Forchuk's junior career came to a close last night for the Canmore Eagles (AJHL) earlier than expected. His junior team was swept in the first round by the 7th seed Olds Grizzlys in three games. Each game the Eagles lost by a goal with the final loss coming in overtime. In three playing games for the Eagles he had 4 points (1 goal and 3 assists). He finished with 201 regular season points (72 goals and 129 assists) in 162 career games for Canmore. The reining AJHL scoring champion will now head to Hamden in the fall to begin his collegiate career with the Bobcats. Another player's junior career is also over as Camrose Kodiaks (AJHL) defenseman T.J. Brown team was swept by the Okotoks Oilers in three games. After the loss, the Camrose Kodiaks tweeted good luck to T.J. Brown along with several other players who were either committed players or had aged out of juniors signaling he will head to Hamden in the fall. Brown will join fellow freshman defenseman Joe O'Connor along with transfers Brandon Fortunato and John Furgele as the newcomers on the Bobcats blue line. In 58 games played this season, Brown had 31 points (5 goals and 26 assists). He also had one goal in three playoff games for Camrose. In 171 regular season games played for the Kodiaks, Brown had 82 points (20 goals and 62 points). 1997 forward Matthew Creamer of the Nanaimo Clippers (BCHL) season also came to an end and as well as his junior career as he is expected to be apart of the 2017-2018 incoming freshman class. His team fell in five games in the first round of the BCHL playoffs to the Victoria Grizzlies. Creamer had 3 points (1 goal and 2 assists) in the five games. He finished the regular season with 36 points (19 goals and 17 assists) in 56 games played. In two seasons with Nanaimo, Creamer a native of Warwick, Rhode Island had 44 points (25 goals and 19 assists) in 103 games played. Jacob Quillan a 2002 forward for the Steele Subaru Major Midgets (Nova Scotia) is averaging 1.16 points per game in the NSMMHL playoffs. In six playoff games he has 7 points (1 goal and 6 assists). Quillan's goal was a triple overtime winner in Steele Subaru's win over Halifax McDonald's. The youngest player on the Steele Subaru roster has elevated his game in the playoffs after scoring 28 points in 36 regular season games this year. 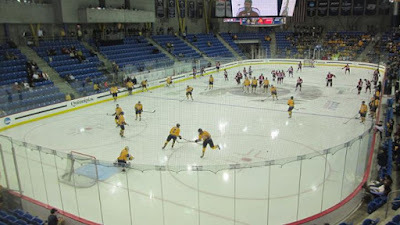 Facing a winner take all decisive Game 3 in the ECAC Quarterfinals the Quinnipiac Bobcats men's ice hockey team punched it's ticket to Lake Placid and the ECAC final four with a 3-2 win over the St. Lawrence Saints in front of a crowd of 1,482 at Appleton Arena in Canton, N.Y. It's the fifth consecutive season that Quinnipiac has reached the final weekend of the ECAC tournament where their opponent next Friday is the top seed Harvard Crimson in the semifinals. This is also the first time since the 2007 season that Quinnipiac has won a road quarterfinal playoff series. Just like the previous night, Quinnipiac got the game's first goal. 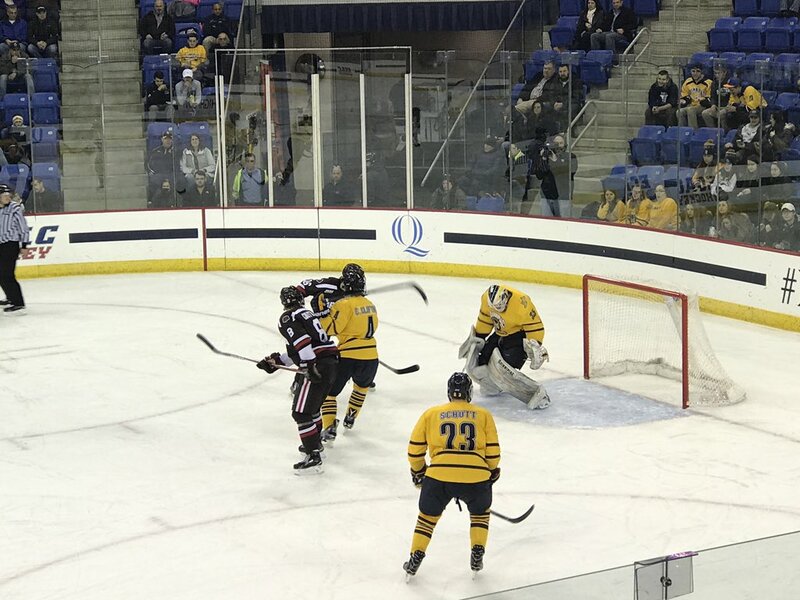 With Quinnipiac on the power play, Luke Shiplo crossed a pass to Bo Piper who fed it low to the side of the net where Thomas Aldworth's quick wrist shot deflected off St. Lawrence defender Gavin Bayreuther and past goaltender Kyle Hayton. Quinnipiac continued to get numerous scoring chances in the period yet could muster anything more than the lone goal by Aldworth. It was in this period where Quinnipiac lost senior Tommy Schutt for the game on a cheap elbow stemming from an open ice hit. The Bobcats dominated the opening frame in the shot category putting up 13 shots compared to St. Lawrence's 4. In the second period chippy play continued especially when Quinnipiac's Tanner MacMaster picked up his second embellishment penalty of the game after he was cross checked by Matt Purmal. With the teams now skating four aside, Connor Clifton skated in on the right all alone getting a clean shot off in the air which dropped down and trickled in past Hayton. The play was reviewed for a possible goaltender interference but the call of a good goal on the ice stood giving the Bobcats the 2-0 lead. Landon Smith and Bo Pieper got the assists on the goal. It was the second assist of the game for Pieper. 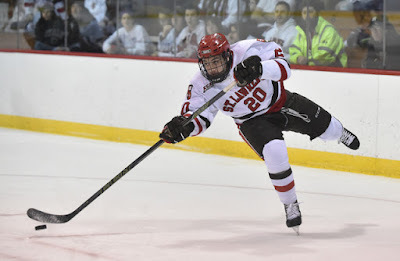 Less than four minutes later, freshman Alex Whelan who has been Mr. Do It All for the Bobcats this weekend picked the pocket of St. Lawrence and skated up ice ripping a high wrist shot five feet past the blue line past Hayton for the goal. St. Lawrence got one back with Connor Clifton in the box for a holding penalty as Eric Sweetman got one past Shortridge with ten seconds to play in the period giving some life into the Saints heading in the third. The ECAC officials continued to be the center of attention in third as they couldn't swallow their whistles and let the players decide things on the ice. Six combined penalties were called including a ten minute misconduct penalty for Tanner MacMaster. Just a little more than eight minutes into the period Mike Marnell got the second power play goal of the game for St. Lawrence trimming the lead to just a goal. The Saints best chance to tie it up came when Ben Finkelstein's shot hit the cross bar. Both Derek Smith and Alex Whelan produced huge blocked shots late in the game to help preserve the win and send the Bobcats to Lake Placid. Andrew Shortridge made 20 saves in the win giving him back to back playoff series wins as a freshman. The ECAC final four is now set with Quinnipiac set to face Harvard for the third consecutive season in Lake Placid while Cornell faces Union in the other semifinal. Quinnipiac and Harvard split the season series with each team winning on their home ice this year. Game time next Friday is set for 4 p.m. The Quinnipiac Bobcats have been pushed to the brink of the off-season after being shutout 2-0 on Friday night before a cow bell ringing crowd of 1524 at Appleton Arena in Canton, N.Y. in Game 1 of the ECAC Quarterfinals. It is the third consecutive game against the St. Lawrence Saints that the Bobcats have been shutout by goaltender Kyle Hayton. This is Hayden's 4th career shutout against Quinnipiac and now has given up only eight goals in seven career games against the Bobcats. Right from the opening face-off it was the St. Lawrence Saints who came out flying despite having last weekend off with a first round bye. 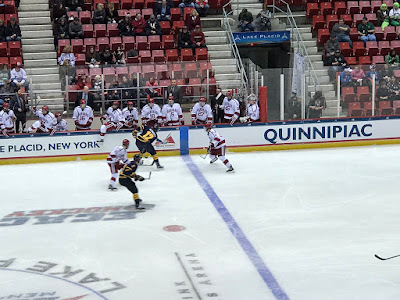 Quinnipiac looked nothing like the team that took Brown to the wood shed a week ago as they were consistently out hustled and out worked throughout the first period by the Saints who hit iron twice within the first half of the opening period. Midway through the period St. Lawrence's Michael Ederer took a Joe Sullivan pass who put it past Shortridge giving the Saints the 1-0 lead. Quinnipiac was out shot 9-7 in the opening frame but was very lucky to be only down by a goal due to the play of Andrew Shortridge as St. Lawrence had the much higher quality scoring opportunities. The Bobcats couldn't capitalize on either of their two power play chances in the first period as the Saints strong penalty kill continued to show why it is one the best in the country. The second period was scoreless until the Saints Joe Sullivan scored a power play goal with less than a second left from Ben Finklestein and Gavin Bayreuther. It was a big time back breaking goal given up by Quinnipiac who had not scored on Hayton in eight periods thus far this season and now trailed by a pair putting the team in a very tough spot heading into the third period. St. Lawrence out shot the Bobcats 12-9 in the middle frame. In the third the Bobcats had their chances with three power play opportunities along with putting 16 shots on Hayton, yet they were constantly denied by the goaltender many consider to be the best in the ECAC. Head coach Rand Pecknold gambled with about 10 minutes left when he pulled Shortridge from the goal on a power play to give Quinnipiac a 6 on 4 chance. The gamble didn't pay off as the St. Lawrence penalty kill showed why it's one if the teams biggest strengths. Late in the game Shortridge was pulled again but Quinnipiac couldn't find the back of the net. Quinnipiac out shot St. Lawrence 32-29 for the game but that number is deceiving as the Saints consistently had the better scoring opportunities throughout this game and were the better team in transition all night. The Bobcats have yet to solve Hayton and need to find a way to cause havoc in front of him because they did very little of that tonight as he saw the puck all night. The two teams return to ice tomorrow night in Game 2 as Quinnipiac looks to stave off elimination and force a deciding Game 3 on Sunday. For the second consecutive week Quinnipiac University freshman goaltender Andrew Shortridge has been named the ECAC rookie of the week. The native of Anchorage, Alaska was strong in between the pipes for the Bobcats in a first round sweep of Brown University in the ECAC playoffs. Shortridge went 2-0 on the weekend and gave up a total of two goals for a .956 save percentage. He saved 43 of 45 shots against the Bears. His last three starts he has given up one goal per game in three victories all over Brown University. In 22 games played this season, Shortridge is 11-5 with a 2.03 goals against average and .919 save percentage. Down the stretch he has five consecutive wins which is the longest winning streak for Quinnipiac this season and he has taken the reins of the goal-tending job full time from junior Chris Truehl. Quinnipiac now plays in a best-of-3 quarterfinal series against St. Lawrence University beginning tonight at Appleton Arena in Canton, N.Y. The Quinnipiac Bobcats head to North Country for the ECAC Quarterfinals to face off against the 4th seed St. Lawrence Saints to play for a trip to Lake Placid and the ECAC final four. This is the Bobcats first road quarterfinal series since the 2011-2012 season when they lost to Colgate as the 5th seed in three games. Quinnipiac does not have great success as a quarterfinal road team as they are 1-6 all-time in ECAC road quarterfinal series. 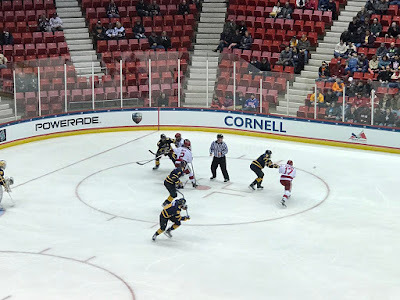 The program's lone win in the quarterfinal round came as a 5th seed back in 2007 when they swept Cornell on the road along with next defeating top seeded St. Lawrence in the semifinals before eventually falling to Clarkson in the finals 4-2. 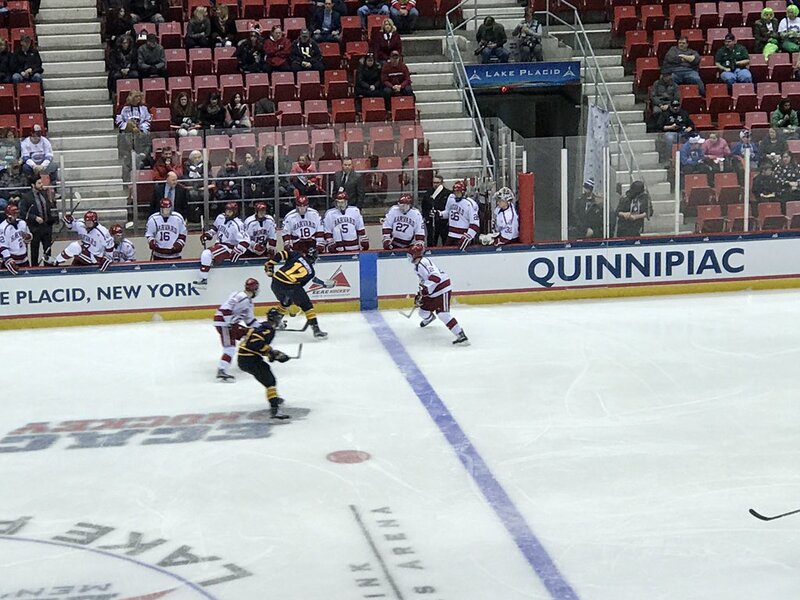 In the seven road playoff series, Quinnipiac has gone to a deciding game six times with the 2009 series against St. Lawrence being the lone sweep in the Saints favor. The Bobcats lost to St. Lawrence 2-0 in early November at Appleton Arena and tied them in Belfast, Northern Ireland over Thanksgiving break 0-0. St. Lawrence last won the ECAC Championship in 2001 and last reached the NCAA's in 2007. The Saints have been strong this season at Appleton Arena going 10-3-2 at home while Quinnipiac is only 8-6 on the road. All-time, Quinnipiac is 5-8-2 at Appleton though they are 3-2 in the last five seasons there. For either one of these teams to reach the NCAA tournament they will have to win the tournament championship so the loser will indeed go home for the year. Quinnipiac comes into this game having swept Brown and are winners of seven of their last nine ECAC games. They are getting contributions from many players up and down there roster whether it be Landon Smith, Thomas Aldworth, the Clifton's, Alex Whelan, etc. 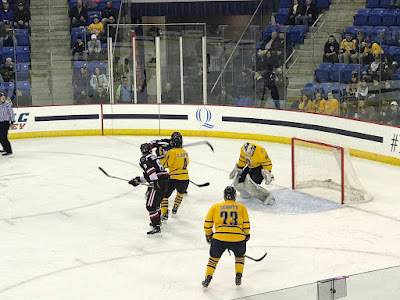 While the opponents have not been grand in those seven wins its enabled Quinnipiac to build some necessary confidence as they head to a tough road environment. They also go in with a hot goaltender in freshman Andrew Shortridge who is 6-1 and is sporting a 1.58 goals against average in his last eight games. Shortridge did not see any game action against St. Lawrence so the Saints are unfamiliar with him outside of watching him on video. St. Lawrence comes into this game 1-4-1 in their last six games and were very close to squandering the 4th seed if they had lost to Dartmouth. You can even make a case that this series could have been played in Hamden had the Bobcats not given up a home game to play St. Lawrence in Northern Ireland. When it comes to the Saints its starts with the man in net, Kyle Hayton, He has been very dominant against Quinnipiac with eight goals allowed in six games played with three shutouts. He will make things difficult for Quinnipiac who need to be able to put a lot of traffic in front of him. If he sees the puck well, he is very difficult to beat. St. Lawrence is a really good defensive team led by Gavin Bayreuther, Ben Finkelstein, Nolan Gluchowski and Eric Sweetman. At times St. Lawrence has struggled to score and they are in the midst of a rough patch right now to a tune of 2.16 goals for in the last six games with a five goal output against Dartmouth mixed in. Both teams have really good penalty kills but staying out of the box in this series is key. Quinnipiac's power play has been solid as of late while the St. Lawrence power play has not been good this season. Getting out to a fast start for Quinnipiac is a necessity in order to silence the home crowd and take control of the game and eventually the series. 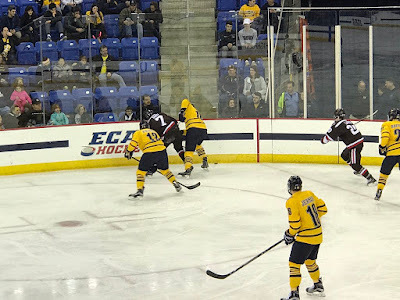 Quinnipiac is riding a wave of momentum right now and playing with a lot confidence and they are getting quality contributions from everyone on the roster. St. Lawrence really struggled down the stretch and limped into its first round bye on a sour note. While Quinnipiac has not fared well against the ECAC top four this season right now this is a different a Bobcat team than the one St. Lawrence saw in November and is really starting to click. I think the Bobcats have more offensive depth, are playing with a confident hot goaltender and have the ability overcome Kyle Hayton in goal and advance to Lake Placid. The Quinnipiac Bobcats wrapped up the season on home ice by sweeping out the Brown Bears in the ECAC first round this past weekend at High Point Solutions Arena. Rand Pecknold's squad now heads to North Country to face the number four seed Saint Lawrence University Saints in a best-of-3 quarterfinal series for the right to reach the semifinals in Lake Placid. Quinnipiac is playing with a lot of momentum as it heads north, having won five games in a row, the longest winning streak of the season. Its a good time for a long winning streak as the only way into the NCAA tournament is to continue to win. The future Quinnipiac hockey players are starting to see their junior seasons end with playoffs starting for a bunch of them. Let's take a look at how some of the future Bobcats did over the course of the last week. 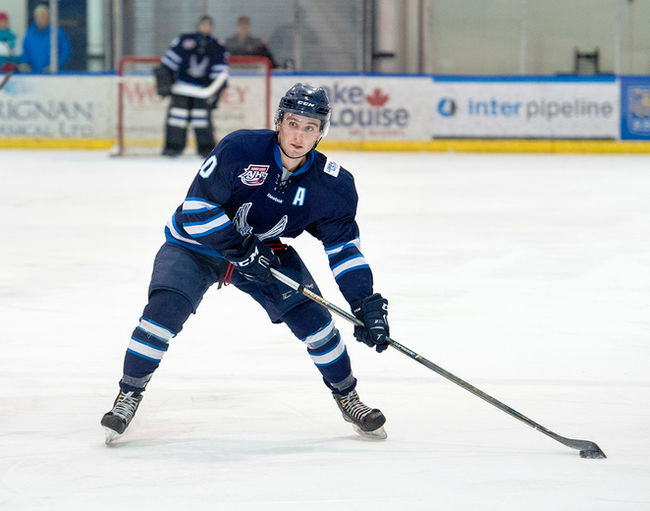 Matt Forchuk of the Canmore Eagles won the Alberta Junior Hockey League scoring title this weekend with a four point weekend (3 goals and 1 assist) edging his teammate Logan Ferguson. The 1996 forward out of Okotoks, Alberta finished the regular season with 97 points (32 goals and 65 assists) in 56 games played. He missed four games for Canmore this season denying him the chance to reach 100 points. Forchuk had a league high 1.7 points per game average along with leading the league with 33 power play assists. His 42 power play points were also a league high as well. In three seasons with Canmore, Forchuk scored 201 points (72 goals and 129 assists) in 162 regular season games played. He is expected to come into Hamden in the fall and make an immediate impact on the scoring sheet to boost the Bobcats offense. Another incoming Bobcat recruit ended the regular season on a high note. Brooks Bandits (AJHL) 1996 defenseman Joe O'Connor, a native of Hamden has been dominant in his last four games played with 11 points (4 goals and 7 assists). He missed the majority of the season due to an upper body injury but since returning he is averaging 1.2 points per game on the blue line in 19 games played. He finished the season with 22 points (6 goals and 16 assists) and is playing with surefire NHL first round draft pick Cale Makar (UMass Amherst commit) as his defensive pairing. A season ago he put up 52 points in 55 games for Brooks. He should be a player that can make an impact on the blue line next season with his size and offensive ability. Muskegon Lumberjacks (USHL) 1999 goaltender Keith Petruzzelli has been strong in four of his last five games giving up just a single goal in each of those four games. The top ranked North American goaltender by Central Scouting is having a strong rookie season in the USHL and catching the eyes of many professional scouts across the NHL. At this point he looks to be someone destined for the second round of the NHL draft possibly even higher by the time the draft rolls around in June. In 28 games played he is 17-9 with a 2.55 goals against average and a .910 save percentage with two shutouts. His 17 wins lead all rookie goaltenders. Recently he was featured in the March 2017 edition of the New England Hockey Journal in an article by Kirk Luedeke who has him as the top New England draft prospect available. Odeen Tufto had a pair of goals in Saturday's 3-2 win for the Sioux City Musketeers (USHL). The 1997 forward from Chaska, Minnesota native has seven points in ten games since being acquired in a trade from the Tri-City Storm. This season in 48 games played he has 35 points (11 goals and 24 assists). He originally began this season with the Fargo Force before his first trade to Tri-City. Having already signed his letter of intent with the Bobcats he is expected to be part of the incoming 2017 Quinnipiac recruiting class though he does have another season of junior hockey eligibility. 1998 forward Michael Lombardi helped his team Kimball Union Academy win the New England Prep School Stuart/Corkey Division Championship over the Rivers School this past weekend. Lombardi finished the regular season with 50 points (19 goals and 31 assists) in 39 games. He averaged 1.28 points per game for the year. He will now embark on a junior career before he reaches Hamden. Congrats to Michael and the rest of his Kimball Union teammates on a hard earned championship. 1999 forward Corey Clifton's high school career came in an end in the semifinals of the NJSIAA/Devils Non-Public Tournament in a loss to top seeded Delbarton 6-3. Clifton who had a goal in the game for Christian Brothers Academy, finished his high school season with 23 points (13 goals and 10 assists) in 13 games played. Clifton is now expected to play at least a season or two of junior hockey before enrolling at Quinnipiac. Another New Jersey high school player committed to Quinnipiac is playing for the state championship of the NJSIAA/Devils Non-Public Tournament. 2000 defenseman John Campomenosi is playing for Don Bosco Prep against top seeded Delbarton on Monday March 6th. Campomenosi has only played in two games this season due to a injury suffered earlier in the season. He has two assists this year. Good luck to John and the rest of his Don Bosco teammates in tonight's game. Steele Subaru Major Midgets 2002 forward Jacob Quillan has six assists in his teams first four playoff games. The highlight was a four assist game on March 2nd in a 9-1 win against the Charlie's Pizza South Shore Mustangs. Quillan finished the regular season with 28 points (8 goals and 20 assists) in 36 games played as the youngest player on the team. He played this season with players a year or two older than him. His older brother Nick Quillan is committed to play this fall at ECAC rival Colgate. 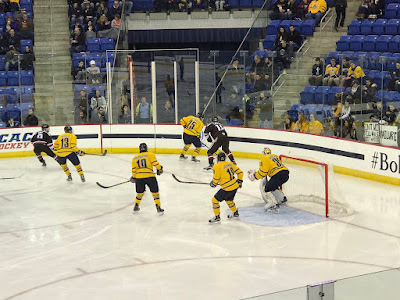 The number five seed Quinnipiac Bobcats swept the number twelve seed Brown Bears out of the ECAC playoffs on Saturday night in front of a crowd of 2,664 to close out High Point Solutions Arena for the season in style. Quinnipiac now heads to North Country to face off against the number four seed Saint Lawrence Saints in a best-of-three series at Appleton Arena beginning next Friday. The Bobcats have won an ECAC playoff series for the 12th consecutive season the longest such mark in the league. The senior class also won its 100th game for their career which marks the second consecutive Quinnipiac senior class to accomplish that feat. Five different Bobcats scored goals tonight in the convincing series clinching win. The hottest Bobcat forward got the guys in gold going just a little over four minutes into the game when Landon Smith took a Tanner MacMaster pass into the high slot and snapped a high wrist shot past Gavin Nieto. It was the 11th goal of the season for Smith and his 5th in the last six games. He has recorded points in his last six games and nine out his last ten. Three minutes later after a hooking call on Brown's Max Gottlieb, Tanner MacMaster wristed one home through traffic with screen help from Kevin Duane and Thomas Aldworth. Luke Shiplo and Aldworth both picked up assists on the MacMaster goal. Andrew Shortridge was rarely tested in the first period as Quinnipiac out shot Brown 22-5. Brown cut the lead in half 15 minutes into the middle frame on Sam Lafferty's 13th goal of the season. It was an immediate response from Quinnipiac just under two minutes later when Tommy Schutt potted his sixth of year on a redirect from Aldworth who put the puck in front of the net. The Bobcats caught a huge break with five seconds left in the period as it looked as if Brown was going to cut the lead again and take momentum into the locker room but Zach Giuttari's goal was waved off for a high stick. In the third period the captain Connor Clifton extended the Bobcat lead to 4-1 as he scored on a cross ice pass from MacMaster while skating into the lower left circle and wristed one past Nieto. It was sixth of the season for Clifton and the assist gave MacMaster a three point night. Bo Pieper scored an empty net with a little more than two and half minutes remaining sealing the series win for the Bobcats. Quinnipiac out shot Brown 47-25 while Andrew Shortridge was strong in net making 23 saves for his first career series win. Quinnipiac will head north next week with a trip to Lake Placid on the line when they face off against Saint Lawrence. The Bobcats lost 2-0 up in Canton, New York back in November and tied the Saints in the Friendship Four tournament in Belfast, Northern Ireland at the end of November. This should be a fantastic series with Quinnipiac riding a wave of momentum up north while Saint Lawrence slumped to end the regular season losing four out of their last six games. The Quinnipiac Bobcats men's hockey team opened the ECAC playoffs in resounding fashion with a 6-1 win over the Brown Bears on Friday night before a crowd of 2,857 at the High Point Solutions Arena. Six different Bobcats scored on the night with 12 different players recording at least one point. With the win, the Bobcats have won 20 games for the sixth consecutive season. This breaks the school record of five consecutive 20 win seasons set back in the 1998-99 through 2002-03 seasons when Quinnipiac was in MAAC Hockey. This is also the 16th 20-win season under head coach Rand Pecknold. The Bobcats got off to a fast start when just 32 seconds into the game freshman Alex Whelan put home a rebound off of Craig Martin's initial shot on Gavin Nieto. It was the 4th goal of the season for Whelan and he has now scored goals in back to back games. Martin and Derek Smith picked up the assists with the latter returning to the lineup after missing senior night with an injury. Nine minutes later Landon Smith sniped home his 10th goal of the season from the bottom left circle with Tanner MacMaster and Luke Shiplo picking up the assists. Quinnipiac dominated the possession in the first period along with out shooting Brown 17-4 in the opening frame. The teams opened the second period scoreless for half the period. A little over 12 minutes into the period Quinnipiac struck again on a two on one chance lead by Alex Whelan with Tim Clifton finishing the puck past a sliding Nieto. Craig Martin picked up his second assist of the game on the goal which was Clifton's team leading 13th goal of the season. Quinnipiac pounded another 17 shots on goal on Nieto in the middle frame. The rout was on in the third period as the flood gates started to open with a power play goal by Thomas Aldworth who dangled the puck past the Brown defender for the goal. K.J. Tiefenwerth and Tanner MacMaster picked up the assists. Three and half minutes later Connor Clifton took a pass cross ice from Landon Smith and put it past Nieto for the goal. Eight minutes later, Tiefenwerth slipped a shot from a tough angle past Nieto for a 6-0 Bobcat lead. Nieto was pulled and replaced with Connor Maher. Brown got a late goal with under six minutes left when Brown's top line put them on the board. Max Willman scored his 11th goal from Charlie Corcoran and Sam Lafferty spoiling freshman Andrew Shortridge's shutout bid. Quinnipiac out shot Brown 46-20 and was strong on the penalty kill going six out of six. Brown showed very little on offense but did show some physical play late in the game. Andrew Shortridge made 19 saves picking up his first career playoff win and became only the fourth Bobcat freshman to start a playoff game behind Justin Eddy, Jamie Holden and Bud Fisher. The Bobcats return to action tomorrow night when they look to close out the series against Brown and book a quarterfinal trip to North Country to face Saint Lawrence.